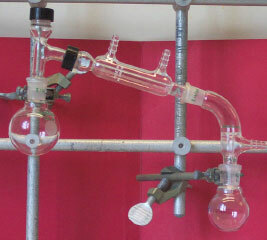 The distillation setup consists of a flask (solution), a three-way adapter, a water-jacketed condenser, a vacuum adapter and a round-bottom flask to catch the liquid that condenses. The water supply (inlet) is connected on the bottom end, while the outlet goes either back to the sink or to the inlet of another water-jacketed condenser. The setup should be clamped in two positions only: the neck of the round bottom flasks. A water bath (~50-60 C) is used as heat source here since diethyl ether does not have a high boiling point (36 C!). The setup has to have a pressure release opening (usually the vacuum adapter). Otherwise teh entire setup will blow apart upon heating. BOOM! 1. Don't fill the round bottom flask on the left more than half in order to leave enough room for the liquid to boil. 2. Don't forget to add a spin bar or a boilng stones (not both) to avoid bumping. 3. Make sure that you have a good seal between the three-way distilling head and the water-jacketed condenser, otherwise the ether will leak out there and drip on teh hotplate. 4. Don't start heating with a setting of "10". The hotplate will get extremely hot and will be very difficult to control. 5. A liquid boils when you observe a reflux ring going up the neck of your hickman head and not when it starts to bubble. Often times, liquids has gases dissolved that are released prior reaching the boiling point. 6. It is imperative to remove the drying agent before you distill the liquid.